Kiss Your Clutter Goodbye with Goodwill & The Container Store! The Container Store has partnered with Goodwill to help you declutter your home and live an organized life while supporting our mission of providing training, employment and supportive services for people with disabilities or disadvantages who seek greater independence. Goodwill has been voted "Best Thrift Store" in the 2016 Daily Herald Reader's Choice Awards! Thank you to all who voted! All moms are amazing, and we asked Club Goodwill REwards members to brag about theirs! Below are the 2016 winning entries. The winner received a $100 gift card from Massage Envy, a $50 gift card from Goodwill, and a beautiful statement necklace. Each of the Honorable Mentions received a $25 Goodwill gift card. Visit one of the following Goodwill Store & Donation Centers at the dates and times listed below and enter to win a pair of tickets to the FREE Drive Birthday Concert on May 20th at the Rosemont Theatre in Chicago featuring Boston and Jefferson Starship. Fifty pairs of tickets will be given away at each store listed. You must be present to win the tickets. We asked you to show us your mad skills for a chance to be named Goodwill's "Ultimate Upcycler." To be consider, 75% of the materials used to create the projects needed to be purchased from Goodwill. In honor of this motto, we're celebrating Earth Day on April 22 by offering 25% off your apparel purchase! 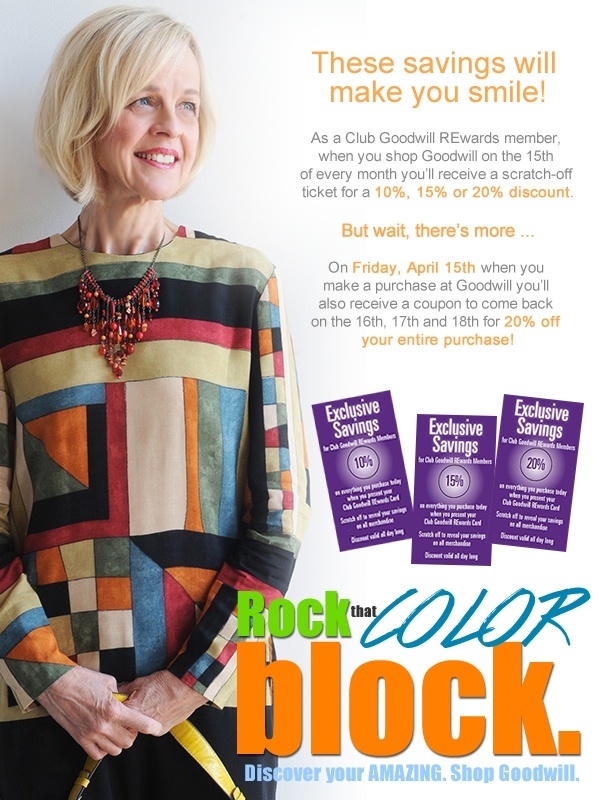 Club Goodwill REwards members, watch your email for details on this special promotion - you MUST print and present the coupon at the time of purchase. Feel free to spread the joy by sharing the email with your friends and family! Click here to learn more about Goodwill's Reduce, Reuse, Recyle philosophy. Scratch & Save on April 15th at Goodwill! The coupon will automatically print at the time of purchase. A "gift card only" purchase and purchases under $.49 will not generate a coupon. Goodwill's Pack'er Up Donation Challenge is Going on Now! Get the entire family involved! Clean out your closets and go to any participating Goodwill Store & Donation Center between Friday, April 1st and Saturday, April 30th, 2016. Simply indicate your school name, city and number of items donated on the slip provided to you by the Goodwill Donation Attendant, and the school with the greatest number of items donated will receive a visit from Donald Driver. Open to elementary and middle schools in the southeastern Wisconsin territory only. We received more than 165 unique and creative submissions in Goodwill's Ultimate Upcycling Contest! Click here to view the top 20 projects that received the most fan votes.These entries have moved onto the final round of voting, where a panel of Goodwill judges will select the Winner and Runner Up. Winners will be contacted via email and an official announcement will be made by Earth Day - Friday, April 22!